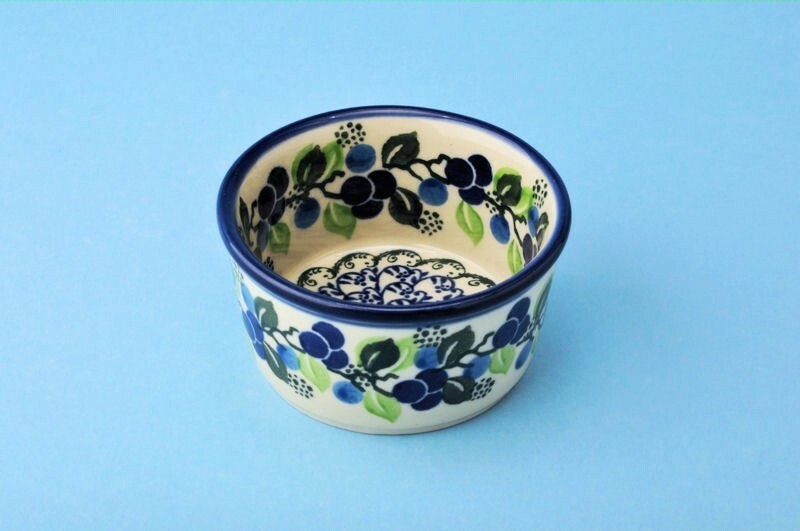 Polish Pottery Ramekin featuring the Blue Berries pattern. 2. Serve chip or vegetable dip. 3. Serve condiments such as sour cream, shredded cheese, or relish. 4. Set it next to your kitchen sink to hold your rings while you wash the dishes. 5. Use it in your bathroom for Q-tips. 6. Place it on your dresser to hold loose change, safety pins, or your favorite earrings. 7. Set it on your desk to hold paper clips or rubber bands. 8. Makes a cute candy dish. 9. Use it as a cooking preparation bowl to hold your chopped onion, minced garlic, diced peppers, or freshly chopped herbs.